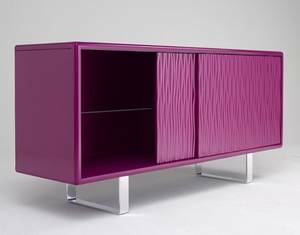 Description A contemporary sideboard cabinet with the body made from 1mm thick sheet metal, hand-welded and finished with a semi-matt acryllic lacquer to create a stylish storage solution. Available with either flush or corrugated sliding wooden doors, the unit stands on polished aluminium runners. Central partition wall divides the unit into 2 internal compartments, each with a glass shelf.